The royal decree issued Wednesday stated that "a majority" of senior royal members from the so-called Allegiance Council supported the recasting of the line of succession. Saudi Arabia's state TV said 31 out of 34 of the council's members voted in favor of the changes. Over the weekend, the king had issued a decree restructuring Saudi Arabia's system for prosecutions that stripped Mohammed bin Nayef of longstanding powers overseeing criminal investigations, and instead ordered that a newly-named Office of Public Prosecution and prosecutor report directly to the monarch. The prince had appeared to be slipping from public eye as his nephew, Mohammed bin Salman, embarked on major overseas visits, including a trip to the White House to meet President Donald Trump in March. That visit to Washington helped lay the foundation for Trump's visit to Saudi Arabia in May, which marked the president's first overseas visit and which was promoted heavily by the kingdom as proof of its weight in the region and wider Muslim world. Saudi-U.S. relations had cooled under the Obama administration after Washington pursued a nuclear accord with Shiite-ruled Iran that the Sunni-ruled kingdom strongly opposed. Despite his ambitions, which include overhauling the kingdom's economy away from its reliance on oil, the prince has faced failures and strong criticism for the Saudi-led war in Yemen, which he oversees as defense minister. The war, launched more than two years ago, has failed to dislodge Iranian-allied rebels known as Houthis from the capital, Sanaa, and has had devastating effects on the impoverished country. Rights groups say Saudi forces have killed scores of civilians and have called on the U.S., as well as the UK and France, to halt the sale of weapons to Saudi Arabia that could be used in the Yemen war. The newly-minted crown prince also raised eyebrows when he ruled out any chance of dialogue with Iran. 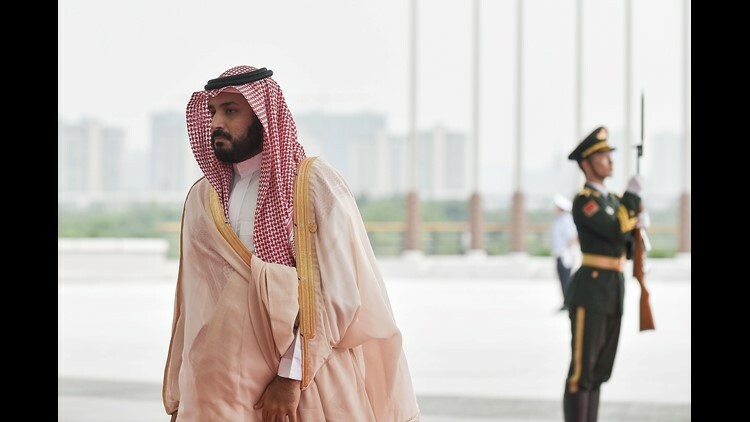 In remarks aired on Saudi TV in May, Mohammed bin Salman framed the tensions with Iran in sectarian terms, and said it is Iran's goal "to control the Islamic world" and to spread its Shiite doctrine. He also vowed to take "the battle" to Iran. Iran and Saudi Arabia's rivalry has played out in proxy wars across the region. They back opposite sides in the wars in Syria and Yemen and they support political rivals in Lebanon, Bahrain and Iraq. The conflicts have deepened Sunni-Shiite enmity between hard-liners on both sides.